Oops! At two years, the group that doubled its fiber intake had a 27% greater chance of dying and a 23% greater chance of having a heart attack. The extra fiber was coming from whole grains. The difference wasn't statistically significant, so we can't make too much out of this. But at the very least, it doesn't support the idea that increasing grain fiber will extend your life. Why might fiber be problematic? I read a paper recently that gave a pretty convincing answer to that question: "Dietary Fibre and Mineral Bioavailability", by Dr. Barbara F. Hartland. By definition, fiber is indigestible. We can divide it into two categories: soluble and insoluble. Insoluble fiber is mostly cellulose and it's relatively inert, besides getting fermented a bit by the gut flora. Soluble fiber is anything that can be dissolved in water but not digested by the human digestive tract. It includes a variety of molecules, some of which are quite effective at keeping you from absorbing minerals. Chief among these is phytic acid, with smaller contributions from tannins (polyphenols) and oxalates. The paper makes a strong case that phytic acid is the main reason fiber prevents mineral absorption, rather than the insoluble fiber fraction. This notion was confirmed here. Whole grains would be a good source of minerals, if it weren't for their very high phytic acid content. Even though whole grains are full of minerals, replacing refined grains with whole grains in the diet (and especially adding extra bran) actually reduces the overall absorption of a number of minerals (free text, check out table 4). This has been confirmed repeatedly for iron, zinc, calcium, magnesium and phosphorus. Brown rice would be quite nutritious if we could absorb all those minerals. There are a few ways to increase mineral absorption from whole grains. One way is to soak them in slightly acidic, warm water, which allows their own phytase enzyme to break down phytic acid. This doesn't seem to do much for brown rice, which doesn't contain much phytase. A more effective method is to grind grains and soak them before cooking, which helps the phytase function more effectively, especially in gluten grains and buckwheat. The most effective method by far, and the method of choice among healthy traditional cultures around the world, is to soak, grind and ferment whole grains. This breaks down nearly all the phytic acid, making whole grains a good source of both minerals and vitamins. The paper "Dietary Fibre and Mineral Bioavailability" listed another method of increasing mineral absorption from whole grains. Certain foods can increase the absorption of minerals from whole grains high in phytic acid. These include: foods rich in vitamin C such as fruit or potatoes; meat including fish; and dairy. Another point the paper made was that the phytic acid content of vegetarian diets is often very high, potentially leading to mineral deficiencies. The typical modern vegetarian diet containing brown rice and unfermented soy products is very high in phytic acid, and therefore it may make sense to ensure plentiful sources of easily absorbed minerals in the diet, such as dairy. The more your diet depends on plant sources for minerals, the more careful you have to be about how you prepare your food. Pro-Fiber folks don't consider DART trials a good proof against fiber because in those trials the consumption of fiber was very low in both groups. I think it was something like 9g and 12g when daily recommendation is 30-35g. I think they are trying to tell that there is a threshold value for the benefits of fiber. What's the best way to secrete uric acid? Is there a food that isn't harmful but causes one to do so? I know I harp a lot on this subject but perhaps the higher death rate was due to: "The extra fiber was coming from whole grains." I think Gary Taubes is probably right, fiber probably is at best harmless. Maybe not though. But grains... especially as we eat them now definitely not harmless! Stephan, what are your feeling toward fruits and vegetables? I think you mentioned before that you didn't consider them essential ... would you consider them beneficial, in spite of the fiber, for all the other nutrients and vitamins A and C? Perhaps it's necessary to discriminate between fibers? Beneficial bacteria ferment certain fibers. The prebiotic fiber inulin, often in combination with various types of oligosaccharides, increases calcium and magnesium absorption (PMID 17951508). Galactooligosaccharide supplementation can relive IBS (PMID 19053980) and improve immune function (PMID 18996881). After a week taking inulin, I have noticed much reduced gas. People in the DART fiber group increased fiber from 9 to 19 g per day at 6 months, 9 to 17 g at 2 years, so it was roughly doubled. So let me see if I have the high-fiber argument straight: doubling fiber intake will kill you, but quadrupling it is healthy. Forgive me if I'm skeptical, especially considering no one has provided any convincing evidence of fiber's health benefits. Gary Taubes went through the evidence in Good Calories, Bad Calories. The best way to get yourself to secrete uric acid into the bloodstream is to eat fructose. I wouldn't try too hard to increase your uric acid though, you might end up with gout! I agree, I think improperly prepared grain fiber is a problem. I don't think it's the cellulose itself that's problematic though, it's probably all the toxins and anti-nutrients that come with it. My guess is that a moderate intake of vegetables is probably somewhere between neutral and beneficial. Vitamin C is a useful nutrient that's found in vegetables, and they also contain minerals. I do think it's a bad idea to follow mainstream advice to have the majority of the volume of your food come from veggies. Unless maybe they're drenched in pastured butter. As you pointed out, there are different types of fiber with different effects on the gut. I'm surprised to hear what you said about inulin though, that stuff gives me the worst gas! Jerusalem artichokes are full of it and they turn my colon into a hot air balloon. I'm not convinced of the benefits of prebiotics, especially in light of what I've been learning about hydrogen gas production by intestinal bacteria. I think there's a reason farts are gross. I know IBS sufferers have seen short-term benefits with supplementing certain types of fiber, but does that hold up in the long term? I've heard theories that fiber is not good for IBS in the long term, and they make more sense to me than the idea that fiber helps. On a tangentially related topic-what is your opinion on a "healthy" occurance of bowel movements? When I steer clear of most vegetable matter, I may go 3 or 4 days without a movement. Many proponents of fiber claim that the undigested bulk which makes you excrete more often equates to a healtheir intestinal tract/body. It seems that the new fad diet now is colon cleansing. Should I be concerned about how often I go, and if so is it worth increasing my fiber intake? Great stuff here, I'm learning something new each day. I eat 4 oz of raw meat or fish with sprouted rice and raw butter for lunch and dinner and 3 eggs for breakfast. I do 30 to 40 minutes of running every other day and pushups and pullups once in while. I know protein requirements are different for everyone but in your opinion is this an adequate protein intake? I don't know how often is ideal, or if there's an ideal at all. I wouldn't worry about increasing fiber to increase bowel movements. If you're constipated, it's probably due to something besides a lack of fiber. Dairy can be constipating, so can a number of drugs. I think that's plenty. How are you feeling these days? I am doing quite well, thank you for asking. I recently started with the "good" cod liver oil to go with the butter oil. The redness and dryness in my eyes seems to be clearly up. I think I need to eat more sprouted rice. In volume the of my meals, the vegetables have been the biggest part with about 4 tablespoons of raw grass-fed butter and 4 oz of meat or fish with about a 1/2 cup of cooked sprouted rice. This has been making me feel like I have less energy. Seems like my body is using the protein, fats, and fat soluble vitamin as energy(eyes starting to burn a little). Today I have scaled back the butter and vegetables in favor of more rice, about 1.5 to 2 cooked cups per meal. If this rice is sprouted for about 10 to 14 days and is pressure cooked with lots of water and mountain salt, I should remain quite healthy. Would you agree? Great info on this blog! well i have added psyllium and oat bran to my diet. do these fall along the same lines as above? A few points: I find it hard to believe that you can't get enough minerals eating rice considering that half the world eats rice with every meal. Anyway, if you're concerned about minerals, you can always pop a multivitamin with a fatty meal. Also, fiber is correlated with positive health outcomes in a large number of epidemiological studies. I'm aware that there is confounding, but the same is true for the intervention study that you described (i.e., what else were they eating with that fiber). Moreover, vegetable oils and polyunsaturated fats are highly correlated with positive mortality and heart disease outcomes in a large number of epidemiological studies. Conversely, saturated fats and glycemic load (that you dismiss) are inversely correlated with these outcomes. Again, I'm aware of the limitations of epidemiological studies, but since there are no controlled intervention studies that are large or long enough to provide much insight, it represents a large fraction of the evidence we have to go on. Also, this trial is of people that have already had heart attacks - not necessarily of much relevance to a healthy population. Furthermore, if fiber was the cause of the increase in mortality in the high fiber group, you would expect the gap in mortality between the groups to keep increasing over time, but you don't really see that. I don't know anything about rice that has been sprouted that long. Are there any cultures that traditionally ate sprouted rice? If not, I'd be wary of making it a staple. In my opinion, oat bran is a bad idea. Psyllium husks also contain phytic acid so I'd be cautious with those too. Half the world eats rice, but it's mostly white rice. And they don't rely on it for minerals or vitamins. That is a one-way ticket to deficiencies, as numerous populations around the world have demonstrated. That's why they fortify it, but even that doesn't make it a good source of nutrients. Healthy rice-based cultures invariably eat a lot of other mineral-rich foods. For example, Japan has a total fish/meat/egg consumption similar to the US. And a low fiber intake, by the way. About fiber, are you sure we're looking at the same graph? In the DART graph I posted, there's a clear and consistent enlargement of the mortality difference between low- and high-fiber groups over time. That is the only controlled trial ever performed that didn't change other variables, therefore it's the best data we have. The epidemiology on fiber is inconsistent and totally unconvincing. Gary Taubes blew it to bits in "Good Calories, Bad Calories". Epidemiology is only good for making hypotheses, unless the association is overwhelming. One well-conducted controlled trial is more significant than a mountain of inconsistent epidemiological studies. There's no explaining away the DART fiber result with epidemiology. I think it's also worth mentioning that the association between saturated fat intake and CHD mortality in epi studies is exceptionally inconsistent. For example, MONICA, one of the largest international epi studies ever conducted, found no correlation between saturated fat intake and CHD death. In fact, some of the countries with the highest saturated fat intake (like France) had the lowest CHD mortality. MONICA was like a much larger and much more thorough version of Ancel Keys' infamous Seven Countries Study. Then there are the other paradoxes, such as the fact that the culture with the highest saturated fat intake in the world, the Tokelauans (nearly 50% of calories from sat fat coming from coconuts) have an exceptionally low rate of cardiac events. I think it's time to put the sat fat hypothesis in the "20th century failed hypotheses" bin. One finding that's somewhat consistent in the epi studies, as well as in the clinical trials, is the omega-6/omega-3 ratio. Lower is better. Does fermenting veggies counteract their anti nutrients? I don't know. I do know that fermenting crucifers like cabbage doesn't remove the goitrogens. I know you've reviewed the Masai before, but they do consume a lot of saturated fat and much less vegetable fat and other processed foods than Americans (even if they do manage to indulge in some of these foods), and have high prevalence of atherosclerosis on autopsy. Stephan, like I said, profiber folks don't take DART nor epi studies with daily fiber amounts <20g seriously because the recommendation for fiber is over 30g/d. 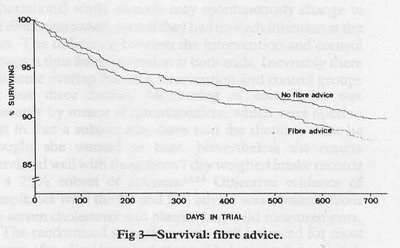 And you can't say that doubling the amount of fiber kills you cos after 2y that result was not significant. Anyhow, there is epi evidence for fibers aid in CHD when the amount is over 30g/d. But there is no clinical trials with that amount and with endpoint as death or cardiac event. To profiber folk this somehow constitutes as a strong evidence for fiber. I myself don't believe that fiber has much to do with CHD but I would be more confident if someone could show me an epi study where >30g/d of fiber did not correlate with better CHD results compared to <30g/d. I don't dispute the fact that some (but by no means all) epi studies show inverse correlations between fiber, PUFA and CHD. But if those relationships were true, why don't they show up in controlled trials? About the Masai, the first thing to remember about them is they have a very very low incidence of heart attack (possibly undetectable), even among individuals 60+. Isn't that the reason why we care about atherosclerosis in the first place? I also think it's interesting to note that Dr. George Mann, the lead author of the largest Masai autopsy study, is a vocal critic of the hypothesis that saturated fat and cholesterol cause heart disease. The Masai he studied had about the same amount of atherosclerosis as Americans at the time, who were eating 1/3 the saturated fat. My interpretation of the Masai data is that the foods they gained access to after the muran period, which is when they rapidly developed atherosclerosis, are the most likely cause. When their diets are restricted to milk, blood and meat, they have much less atherosclerosis. Furthermore, the first autopsy study that was performed on the Masai found that they had very little atherosclerosis, and that study was done in a more remote location with less access to modern foods like flour, sugar and vegetable oils. I just find the pro-fiber argument to be weak. It reeks of changing goalposts to me. OK, they disproved the 20g goalpost, let's move it to 30 where the intervention trials haven't tested it yet. What mechanism could possibly explain a neutral/harmful effect at 20g but a benefit at 30? It's just not a very parsimonious explanation, and the fact that the totality of the epi studies aren't convincing doesn't help. For example, the Japanese eat a low-fiber diet and they're arguably the healthiest industrial nation. The epi studies are good for making hypotheses, but in the end it needs to be tested rigorously. If they do a controlled trial with 30g and it improves survival, I'll be happy to believe the result. I just think it's unlikely at this point. The thing that irritates me is the fiber hypothesis has always been ad hoc. It started with observations by Dr. Denis Burkitt in Africa that natives who switched from fermented whole grains/tubers/plantains to white flour and sugar developed an array of degenerative diseases, including bowel cancer, appendicitis and other digestive problems. The competing, and I believe more accurate, hypothesis is that white flour and sugar cause those problems irrespective of their fiber content. I think that's more in line with the fact that many hunter-gatherer groups ate little to no fiber (because they were carnivorous), yet didn't suffer from the problems Burkitt described until they switched to white flour and sugar. The fiber story had always been one of changing the hypothesis every time it is disproven, constantly keeping it just beyond the reach of the data. I agree with you because I have read my Taubes too but I am just playing the devils advocate here to prepare myself for arguing for my position. I think that they say that there is a threshold value of fiber that gives you benefit and that value is >30g/d. I believe they came up to this conclusion thru epi studies because all epi studies (that I know) show benefit _if_ the amount is over 30g/d. So saying that the evidence is contradictory to profiber folk won't do the job cos they will only take acount studies that have >30g/d fiber amounts. They are not arguing that some fiber is good for you but over 30g/d is good for you. Mechanism for this? No idea. I think there is also clinical trials (no endpoints, just lipid values etc.) showing benefit from fiber so the position that fiber is good for you is justifiable and so the burden of proof comes to us cos we are arguing against current paradigm. Too much, too little-- there are always going to be little optimizations with things. The mass public is not going to look at exact fiber amounts- they need a paradigm of eating that is healthy. I kinda feel like some of the problems with high amounts of fiber is that many foods heavy in fiber also carry large amounts of lectins, or unknown toxins that burden our system. It's very much akin to the fact that peanut butter can cause cardiomyopathy in animals independent of omega 6 imbalances (think lectins, etc). In my opinion, logically the burden of proof shouldn't be on people who don't believe eating a lot of fiber is important for health. The reason is that our "ecological niche" doesn't necessarily include a lot of fiber. By that I mean historical hunter-gatherers typically ate more meat than plant foods. Granted, there wasn't white flour and sugar back then, but when you get 75% of your calories from animals and don't eat low-calorie plant foods (vegetables), your fiber intake isn't going to be particularly high. Especially since the richest source of fiber in the modern diet is whole grains and beans, which most HGs wouldn't have eaten. I agree with you that the perception is that the burden of proof is on those who are trying to swim against the current, which is a shame. I'm with you. I doubt cellulose is really the problem. It's more likely to be all the nasty crap that comes along with it when it's coming from grains. I'm still very unsure- I have given up all gluten grains, but include some rice with some of my meat and vegetable meals. 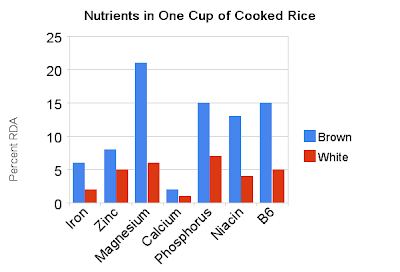 Considering the overall minerals and antinutrients would you recommend white rice or brown rice (soaked 12-16 hours or so)? Everything about this article helps me understand why I get such bad acid reflux from grains! I am so grateful for your research! I feel alleviated by such sources. I am saddened though by the response that I've received from Dr's when I tell them I would like to fix my problems through nutrition. Maggie. I'm wondering why the Japanese live longer and enjoy better heart health. They eat rice several times a day, and the only thing they do is rinse the rice thoroughly and then drain it thoroughly before cooking it. They eat a lot of vegetables, rice, and eat half the meat that Americans and Europeans do. They eat fish but in small amounts, more as condiments to rice and vegetables than anything else. Ah, that carb-heavy diet. It is lower in calories than what we eat, though. White rice doesn't contain phytic acid, that's in the hull. Are you for real? I have Japanese relatives, they LOVE fish. Fish are not condiments to the Japanese, they have one of the highest consumption of seafood in the world. All the best fish and freshest seafood in Australia gets exported to Japan because the demand there is so big and they're willing to pay a premium for it.